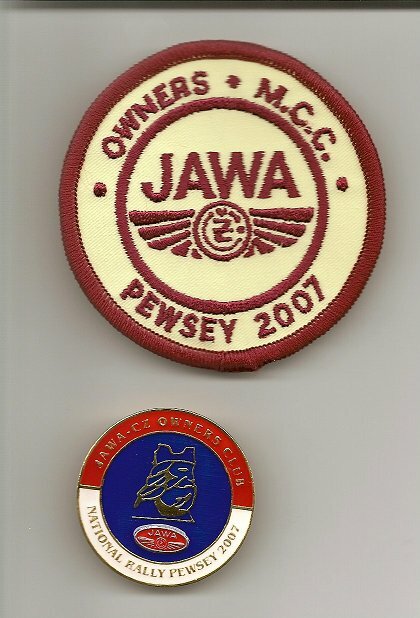 In April 1977 the JAWA CZ Owners Club held it’s first ever National Rally at Lydiard Park, Swindon, and as a result of the success of the rally, later that year the Swindon & District Branch was formed. So with 2007 being the 30th anniversary year of the Branch, it was decided by the Branch committee over 18 months ago to offer to run the 2007 National Rally to celebrate this anniversary. Bob Bizley (Swindon Branch Treasurer) offered to be the primary Rally organiser with back up from Ian Bridge (Branch Secretary) assisting him. Other Branch members also offered help and so with the approval of the National Committee, organisation started. Lydiard Park as a venue was not now possible, so other venues were looked at. 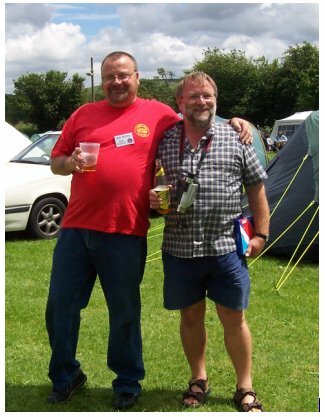 Wootton Bassett RFC which has been used for a previous National and East European Rally was a possibility, but in the end following some negotiations by Bob, our normal annual Branch camping venue of the Coopers Arms at Pewsey in Wiltshire was chosen. There then followed several months of intensive letter writing and arranging things, as each element of putting on such an event had to be put in place. Sponsorship letter sent out, rally badges designed and ordered, information sheets published and placed on numerous web sites, a rally programme put together and of course liaising with the Coopers Arms on the actual site equipment required etc. I really do have to compliment Bob on the way he has evolved such an excellent relationship with the Coopers owner which really helped to smooth things out and make sure everything was in place. One of the main objectives was to try and keep as many people attending together on site, and not to have fragmentation which can so easily happen. It was also the plan to try and offer an event which harped back to the early day of our rallies, before we started to use the luxuries of rugby club houses, but to still offer the type of services that members have become used to. The Branch also wanted to offer the very best of value and so planning was put in place to see what ‘extras’ could be offered at no additional cost to those attending. So over the months each element gradually came together, and it was also decided to offer those who pre-booked (this helps greatly) the guarantee that in addition to their normal rally badge they would also get a special rally sew-on patch. Those that didn’t pre-book would not get the patch as part of their rally fee. In addition we were fortunate that a number of companies sponsored us with cash donations, which meant we started with a healthy rally fund, so we didn’t have to draw upon any national club funds. With rally directional signs made by Tom Soffe (thanks Tom), marquees and bar arranged with the Coopers, superb badges and T shirts made by our good Czech friend Libor (JawaManiak) Filak, loads of prizes donated by various companies and organisations we were ready to get the event underway. With the promotion we had done, pre-bookings were the highest ever, so it looked like we were going to get a bumper turn-out, and that included some overseas friends. As the rally date approached there was a flurry of activity as both Bob and Ian put the finishing touches to what promised to be possibly one of the best ever rallies. Right from the outset Bob chose to make the event not just Friday to Sunday but to also allow those who wanted to make more of a holiday the opportunity to come early and to leave late, so the actual site was open from Wednesday 13th June with it officially closing on Monday 18th June. On the 12th Bob once again visited the Coopers where a team were erecting the two marquees, and on the Wednesday he loaded up his car and started to take to Pewsey some of the items needed. Ian did likewise but he took what he had, on the Thursday. Both Bob and Ian breathed a sigh of relief at this stage as their garages suddenly became less cluttered. Wednesday saw a number of early arrivals including Jack Wainwright (one of the Branch’s founding members), and so after all the hard planning and work the event was at last underway. Following a spell of good weather, dark clouds started to arrive on the Wednesday and with the cloud came torrential rain. While Pewsey missed the worst of it, other parts of England suffered the worst rain storms and flooding in 24 years. All of a sudden there was great concern that people would not turn up in the numbers expected, however despite this set back, Jawa CZ owners are obviously made of sterner stuff, as despite many having to travel in awful conditions they started to arrive in a steady stream. I must mention Ian Bridges from Sheffield whose house suffered flooding, but after a quick use of an aquavac to get rid of the worst effects, he too arrived on his Jawa 500R Special, that’s what I call dedication to the Club. Bjorn Halvorsen from Oslo after coming by ferry from Stavanger to Newcastle too had to travel in monsoon type conditions, not actually arriving till 21:00 on the Friday. By the time Bjorn actually arrived back home he had travelled a total of 2100km (1230 miles). When you get people like this who are prepared to travel such long distances to our event, it really makes me wonder why so often local members who only have a few miles to travel don’t bother to support, even if they only come as a day visitor. Friday evening saw the bar in one of the marquees open, and there was also a booze raffle, with a variety of drinks from around the world. With a PA system provided by Joe Cowley, set up, we were able to have some background music as people sat around chatting and drinking. Very civilised! Saturday dawned overcast with threatening clouds and I’m sure a few hangovers, but again Pewsey was fortunate in that it missed the majority of showers, it seemed to almost have its own microclimate. The catering van on site opened up for breakfasts at very reasonable prices, and by 11:00 bikes were lining up to go out on one of the two run-out. John Kennedy led the larger group out on a run to the Crofton Beam Engine, Wilton Windmill and then back along the route of the Kennet & Avon canal. 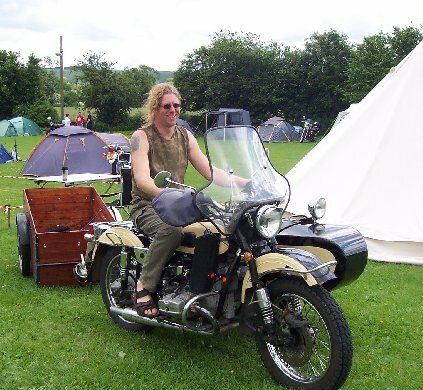 Ian Bridge (now on his new Jawa 650) led a smaller group on back country roads to the World Heritage site of Avebury. While there, some went off to explore while others just took refreshments in the popular Red Lion Pub. On their return journey they passed Silbury Hill before stopping off at the Barge Inn in the small hamlet of Honeystreet, where the pub is right next to the K & A canal. Saturday lunch time again saw food available from the catering van, while during the afternoon children played garden type games, and the bikes were all lined up for the judging and photo call. 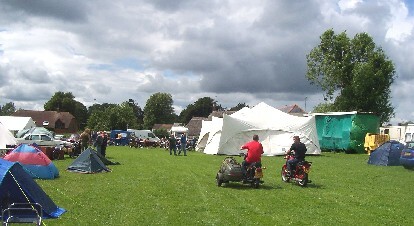 There were a number of people selling Jawa CZ items and spares including the large ‘Gibby’s Bazaar’. 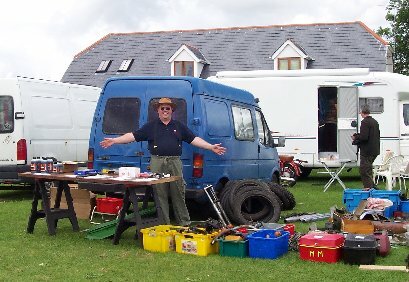 Roger Gibson had brought along a whole van of spare parts for sale and I’m sure any bits that anyone could want were available. One guy on a very smart MZ 150cc had a slow puncture and ‘Gibby’ was able to sort him out with a replacement tyre and tube, whilst Tom Soffe and the Editor and the Club Secretary among others, all assisted with the loan of tools and advice. At this point I would like to thank Gibby for organising all the prize trophies, they were superb small silver salvers – very smart. Gibby with his selection of Jawa CZ bargains!! Saturday evening saw a further raffle for many varied items to be won, along with the prize giving presentation. I’m sure the full list of winners will appear elsewhere, but Bob Bizley certainly earned him being presented with the Club’s highest trophy – the Bob Rixen award. Ian Bridge was also embarrassed by being presented with a special award for 30 years work for the Swindon Branch. Following the prize giving a hot buffet meal was laid on for all there, and despite such large quantities of food, there was very little left. One rallygoer even commented to Ian Bridge that the meal alone was so good as to be worth the rally fee. Praise indeed to the Coopers who provided the food. Drinking went on till late at night but with most very tired it was very much a quieter night with only a few staying up till late. Sunday morning dawned damp, but the worst of the rain had stayed off. Some people packed their camping gear away and made an early start for home, while others took things at a more leisurely pace, and some were staying over until the Monday. Mid morning saw Bjorn Halvorsen head off to see a friend before returning to Norway, and the German couple also headed off at mid-day. Martin Broomfield and a few others went off on a run to nearby West Kennet long barrow, while much to our surprise a Slovakian Jawa owner towing a Pav trailer turned up. It seemed the guy was actually working in London but could not get away on the Saturday to join us. It was good to meet him and we made him as welcome as we could. All who were still on site were treated to a ‘no cost inclusive’ midday lunch from the catering van, and as there was still a reasonable amount of drink available at the bar in the barrels that had been bought, as any left over couldn’t be send back it was decided to let those still there have what drinks they wanted at no cost. Although there were people on site till the Monday, Sunday effectively saw the event finish. Without doubt the rally despite the less than ideal weather turned out to be extremely successful. All the hard work had proven to be worthwhile, old friends were reacquainted and new ones made, and I don’t think anyone can grumble about the tremendous value they got for their rally fee. Mick Berrill of Mick Berrill Motorcycles. Plus the many others who supplied items for prizes and for us to sell. All were listed in the event programme and a complete list is available from Ian Bridge. These companies supported us, so SUPPORT THE COMPANIES WHO SUPPORT US.